I have been looking at carburetor application listings and found that the 262 engine used a Holley 1904 carburetor in 1961-62. It appears the 240 and 300 may also have used a 1904 in some applications from 65-68. Does anyone know whether these 1904s were larger than what was used on the passenger cars and light trucks? Would they have a spark control valve? peeeot wrote: I have been looking at carburetor application listings and found that the 262 engine used a Holley 1904 carburetor in 1961-62. It appears the 240 and 300 may also have used a 1904 in some applications from 65-68. I collected a bunch of E-Bay "parts only" 1904's for 'tuning' the Tri-Power setup on the '61/250. Used on IHC, Rambler, Dodge and other applications besides Ford, there are all sorts of variations, the difference (to me) being 'big " (1-9/16") and "small" throttle base plate (1-7/16"). Ford Falcon/Comet etc., are all 'small' and probably Rambler applications also ranging in CFM from @ 125 to 150 CFM. The 'big' throttle baseplate probably are truck apps' and probably have higher CFM's. Ford apps usually have SCV but other apps' do not. BD (C. O. E.), and 282 BD truck engines. Thank you very much! This is the kind of info I'm after. Does the "large" throttle bore model use the same bolt spacing as the "small?" Which would the 223 have? I have been able to confirm that the 262 carbs had a spark control valve, so there that. In case it isn't clear, I'm trying to figure out whether a 262 1904 would be a bolt-on cfm-boost over the stocker on a 223. Seems like the Venturi size at least would have to be larger. I learned that the 262 trucks most likely have the same 1.25" Venturi as my fairlane's 1904. There seem to have been some 1904s in the 1955-56 range with 1 3/8" venturis, but the real ticket for a higher cfm 1-bbl designed to work with the 223 and loadomatic is the 1956-57 only Holley 1960. I found very little info on the net about these carburetors, but they have a much larger main Venturi (I believe 1 7/16") and a booster Venturi built into the choke plate. They also lack a spark control valve, instead having a check ball in the manifold vacuum passage which serves a similar purpose to the SCV. I would guess the SCV is an improvement since all the later carbs used them. Anyway, I am now looking for a 1960 if anyone knows where one can be bought! Thanks for adding to the info base on 1904 type carbs. The many variations are confounding at least. I believe the 1904 with the SCV valve is the exception . the 1904 was used on many different vehicles from IHC' to Fords through the early sixties. I am under the belief the SCv was used on the Falcon but not most others. The mothballed Clifford built 250 I had the good fortune to turn up, was equipped with three extremely clean rebuilt and modified 1904's with SCV's. They look great and have some interesting mods' like milled airhorn to allow standard air cleaners, removed, and filled choke shafts as well as plugged vac ports (Duraspark dizzy). I tested each of the Clifford modded carbs individually on my stock Falcon 170 "test bed" . I was very disappointed to find only one of the Holleys ran decently. The Clifford setup used a "big" 1904 with the 1-9/16" base in center and 1-7/16" base front and rear (rear one ran good). After rebuild kits and many hours of testing I got nowhere and was frustrated. So I got determined. I started cruising E-Bay for 1904's and found they show up regularly and there are many versions. I started picking up a few - often they go cheap but clean ones, especially glass bowl types get a good price. The great majority DO NOT have the SCV. They are categorized (App' & CFM) by the "List Number" but I've not found two the same. I test each one on the 170. A couple ran good untouched and I'm experimenting swapping metering blocks, jets etc. with some success. I've got a few that I just can't figure out and a few running great. Differences between them are mainly the base and venturi size. Some have marked main jets - most don't. There are lots of low price carbs available. I paid less than $20 for most. I'm convinced it's true that Carburetor is French for "Don't F%#& with it..."
I have found they are available from a carburetor rebuilding company called "autoline" and am planning to obtain one. I wish I could find a 1960 for $20! The cheapest core 1904s I see for sale now are $75+. So what is the purpose of the weird choke plate on the 1960? I have one in my small collection of carbs. on the bench right now. List 1154, EBP-9510-H with the provision for a dash pot for automatic transmission. It came with my used Offenhauser intake and a mismatched 1904. Should I be looking for another one for my 2 X 1bbl. intake? I'm a Fordaholic! '30 Model A pickup, '55 & '56 F100, '76 Lincoln Town Car w/64k miles "cream puff"
The "weird" choke plate has a booster Venturi built into it. 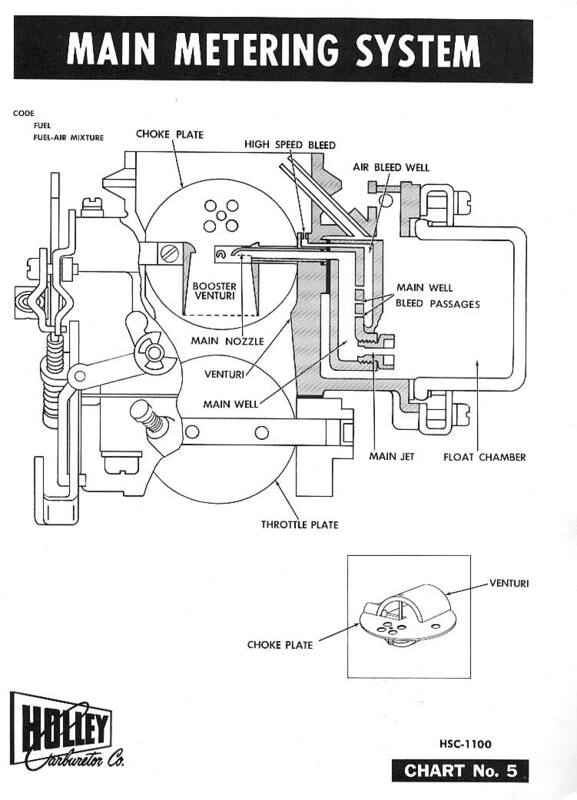 When the choke is open, it amplifies the vacuum signal to the fuel discharge nozzle. The 1904 is the only "modern" 1-bbl downdraft carb that LACKS a booster Venturi, to my knowledge. Carter YFs have a triple booster. Since the 1960 has a very large Venturi compared to its throttle bore, it needs the booster to get good response and atomization from the main fuel nozzle at lower engine speeds. The 1904 has such a small Venturi for the engines it's paired with that no booster is required.